Last week Victoria University MSc student Delaney Burnard and I had a quick trip to the South Island to collect lycophytes for Delaney’s research. Lycophytes are sometimes called “clubmosses”, but they are not related to mosses. They are actually more closely related to ferns and seed plants. Lycophytes differ from seed plants in lacking seeds, and from ferns in generally have small, simple leaves. 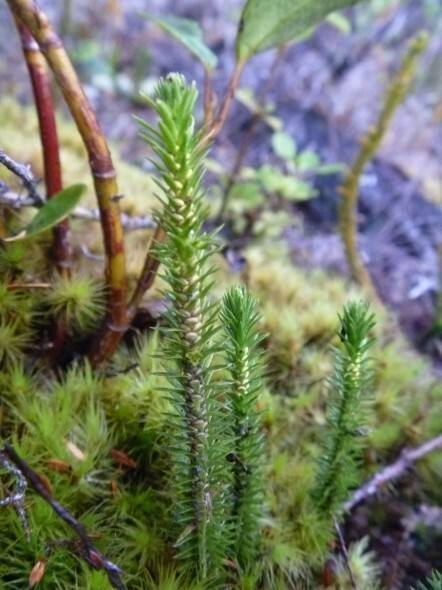 Huperzia australiana (fir clubmoss), Takaka Hill. Unlike many other lycophytes this species doesn’t have distinct cones but produces its spores in sporangia where the leaves join the stem. Photo: Lara Shepherd. Delaney is using DNA to construct a family tree of the New Zealand lycophytes. 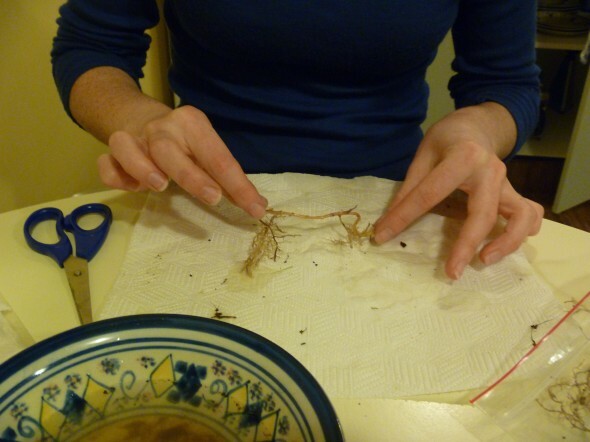 She is also looking at what types of fungi live within the shoots and roots of these plants. Although we typically think of fungal infections as being bad (like the mouldy orange in your fruit bowl or athlete’s foot), as many as 90% of plants are thought to require fungi to develop and survive. The fungi help the plants to absorb certain nutrients from the soil, with the fungi also benefitting by gaining some of the sugars produced by the plant. Determining which types of fungi are symbiotic with early-evolving land plants, like lycophytes, will help us understand which types of fungi were first to form relationships with plants when plants initially colonised land. The first stop on our fieldwork was Takaka Hill. The previous week had seen snow on the summit so we were lucky to have a sunny, albeit cold and frosty, day. 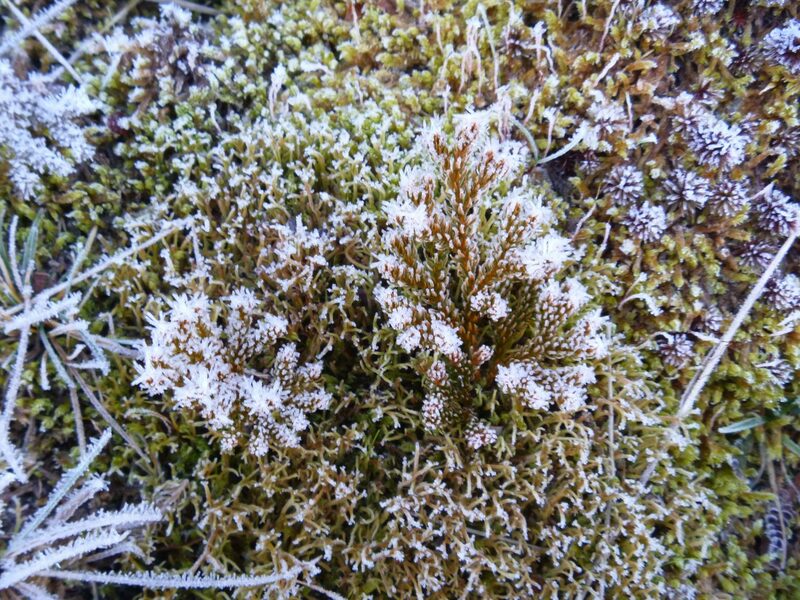 Even some of the lycophytes were frosty! 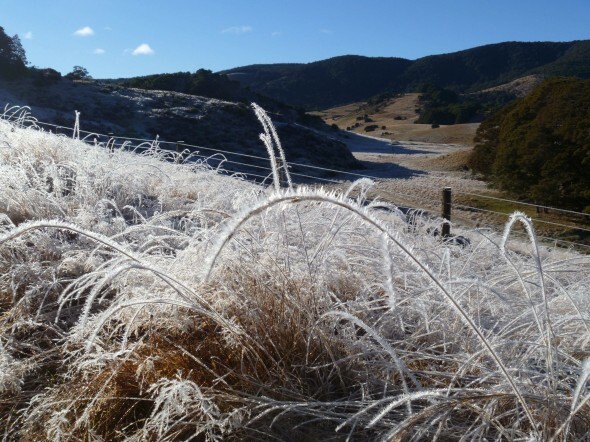 A frosty Lycopodium fastigiatum (alpine clubmoss) on Takaka Hill. Photo: Lara Shepherd. 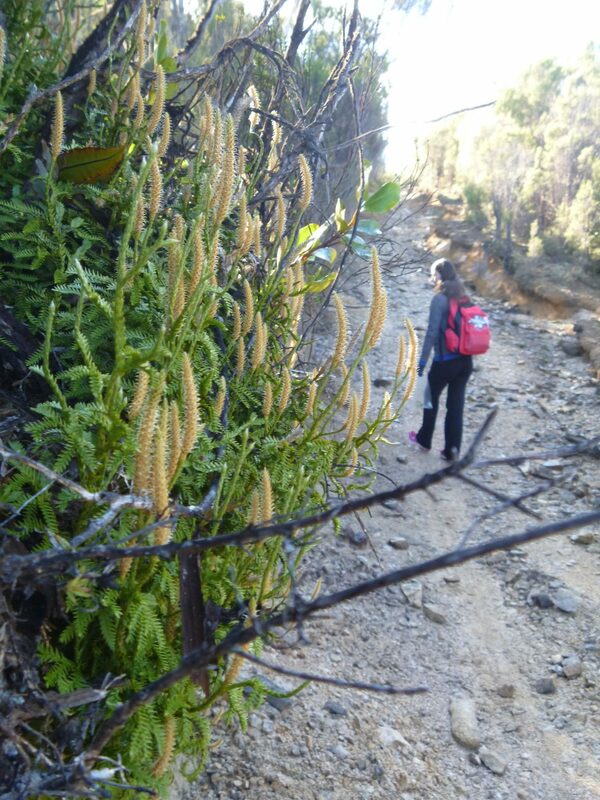 Lycopodium scariosum (foreground) and Delaney (background) looking for suitable samples on Takaka Hill. Photo: Lara Shepherd. One good find on Takaka Hill was Huperzia australiana (fir clubmoss), which I had only seen once before. It mostly occurs in alpine and subalpine regions on the mainland of New Zealand. Next we headed to the West Coast where we found Lycopodiella diffusa and L. lateralis. These two lycophytes were growing near each other in a swamp, with L. diffusa favouring the more open areas. They are difficult to tell apart at times and their species status has been questioned. With the data she is collecting, Delaney may be able to shed some light on whether they really represent two species. 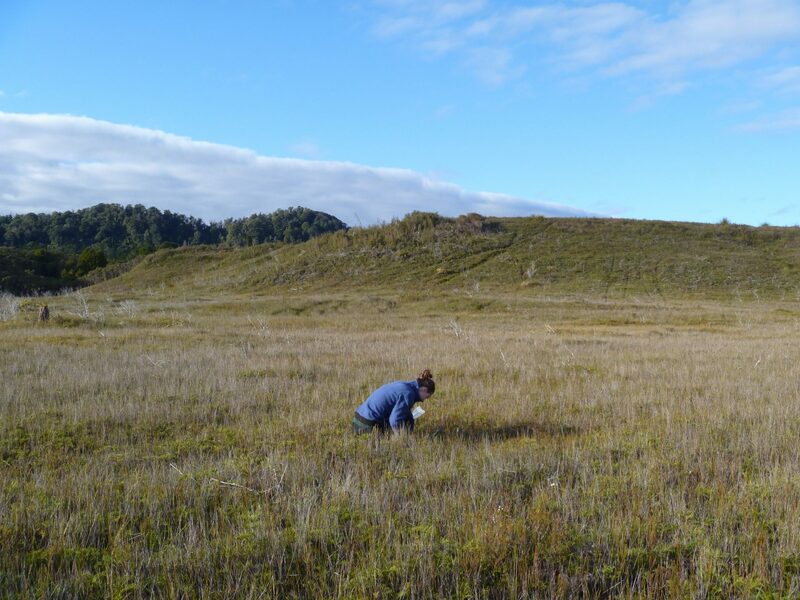 Delaney collecting Lycopodiella diffusa from a swamp near Charleston, West Coast. Photo: Lara Shepherd. Our last major collecting stop was Okarito, where there was an abundance of Phlegmariurus varius (long clubmoss, also known as Huperzia varia) hanging from the trees. Delaney washing dirt from lycophyte root samples. These samples will have their DNA sequenced to see what fungi are present. Photo: Lara Shepherd. Next Delaney will be heading to the lab to begin coaxing DNA from the samples we collected.